Saint Bucolus: Middle Child Syndrome? There is not a lot of information about Saint Bucolus but that suits a greater purpose. And … that’s all she wrote. No! Saint Bucolus was ordained and consecrated bishop of Smyrna by none other than Saint John the Evangelist. Saint John was the youngest of the Twelve Apostles and one of Jesus’ personal favorites. He wrote a Gospel, some letters, and the Book of Revelation — a copy of which he sent to the church at Smyrna. He survived multiple attempts to martyr him and lived to a ripe old age — during which time he passed the power of the priesthood and the authority of the apostles down to a successor: our own Bucolus! You shone with the rays of virtue/ received from him who leaned on the Master’s breast. He who was beloved of Christ/ saw the purity of your life;/ he made you a shepherd of the Church. These two hymns tell us that Bucolus received virtue from John and he received authority from John. John received both of these from Jesus Christ. It is also worth noting that when John wrote to the church at Smyrna, he was probably writing to Saint Bucolus. Saint John’s brief message to Smyrna gives you a glimpse into what was going on there: The Christians were persecuted but John tells them they are materially poor but spiritually rich. “I know your tribulation and poverty, but you are rich. I know the slander of those who claim to be Jews and are not, but rather are members of the assembly of Satan. Do not be afraid of anything that you are going to suffer. Indeed, the devil will throw some of you into prison, that you may be tested, and you will face an ordeal for ten days. Remain faithful until death, and I will give you the crown of life. New Advent, the Catholic Encyclopedia tells us that the Book of Revelation is dated around the end of the Emperor Domitian’s reign, which concluded in the year 96. Unless the dates given for Saint Bucolus’ death are incorrect, this lands during his life time. So why does Bucolus get so little attention? Here is my guess. Succeeding him as bishop of Smyrna was Saint Polycarp. Saint Polycarp was a miracle worker. He cast out devils, stopped raging fires, cured sick people, and prophesied his own martyrdom. Besides all this, everyone knows that Saint Polycarp was converted and baptized by Saint John. Maybe the hagiographers (saint biographers) are star struck by that fact because most of the sources I checked about Saint Polycarp, quite rave about the whole Saint John connection but completely skip over Saint Bucolus. Yet it was Bucolus who ordained Saint Polycarp a priest and, before he died, picked him out as his successor. Sources say that Saint Polycarp tried to imitate the virtue not only of Saint John, not only of Saint Paul, but of Bucolus. Saint John thought Bucolus was awesome and Saint Polycarp thought he was awesome, too! However, sandwiched right between these two superstars of the early Church, the gentle, wise, non-martyr Saint Bucolus comes down to us sort of as a middle child. We love what’shisname. That’s OK because the life of Saint Bucolus illustrates perfectly the continuity of the Catholic priesthood. Saint Bucolus received his priesthood and apostleship from Saint John, who received it from Jesus Christ. In the same way, your parish priest – even if the world all but forgets his name — can trace his apostolic lineage all the way back to Christ. There’s no greater purpose than that. This article was originally published on the Catholic Digest blog, February 2018. 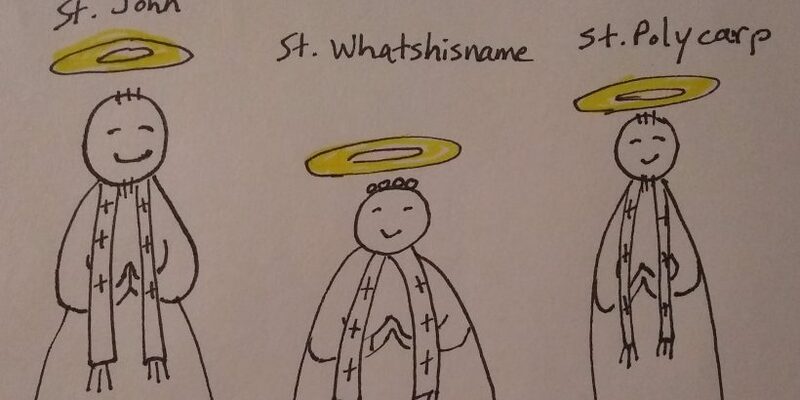 Read more Saints with Funny Names here! « Homeschool Impossible: Your Spouse Helps Teach – Nicht!